Parents are always asking us how they should interact with their young soccer player before games and during practice. They want to know how to best support their soccer player’s confidence. Here are a few general guidelines parents can use to help their young athlete perform with confidence and enjoy soccer! 1. Soccer should be just a game for young athletes. Soccer is just a game for young athletes–it is not a business. With all the money in professional sports today, it is hard for parents to understand that soccer is just fun stuff for young athletes. Focus on the game instead of the rewards that may come from the game. 2. Self-motivation or intrinsic motivation is the best type of motivation. Soccer players love their sport and love the competition–that is enough of a motivator for most athletes to drive them. Motivation must be cultivated from the love of sports and competition – from within the athlete himself. Try to avoid giving rewards and extrinsic motivators to motivate your child. You want them to practice and compete for themselves and not because they want to do it for you or to please a parent. 3. Your agenda is not your child’s agenda. Young athletes play soccer for many reasons. Maybe they love the competition, the social aspect, being part of a group, or the challenge of competition. Your agenda for your child’s participation might interfere with your child’s motivation to compete. Make sure you understand their motivation to compete before imparting your desires. 4. Help your athlete focus on the process of execution instead of results. We live in a society that focuses on results and winning, but winning comes from working the process. Of course everyone wants to win, but teaching your child to focus on the process, the here and now, and focusing on one play at a time will help them play in the moment and with confidence. 5. Model composure and poise on the sidelines during games, as you are a role model. When on the sideline, your child will pick up and mimic your behavior. You become a role model in how you behave, particularly in big games or pressure packed moments. If you become tight, serious, or frustrated in big games, so will your child. To perform well, the goal is to be loose, carefree, but at the same time focused on playing. 6. Always precede constructive criticism after a game with positive reinforcement. It’s easy to jump in and give your child advice on what not to do in the next game or how to do better, but you should first give positive encouragement and pick out one or two skills your child did well. 7. Resist sideline coaching during games. Practice and training are over. During games, it’s time to let them play. Athletes have to let go of the training and technique so they can trust what has been learned and practiced. “Just do it” as the saying goes. Too much coaching on technique or what you think your player should be doing can lead to a controlled or cautious performance. 8. Help your athlete detach self-esteem from achievement. Too many athletes we work with attach their self-worth to their level of performance. Help your athlete understand that they are a person FIRST who happens to play soccer instead a soccer player who happens to be a person. Success in sport should not be the determinate of self-esteem. Help them separate the person from the athlete. Remind them that you love them no matter what happens on the field. 9. Separate your role of a parent from your role as coach. Many parents wear the hat of coach too. This has both advantages and disadvantages. The danger is that your son or daughter is not able to separate the constructive criticism you give when in the role of coach from you being the parent. It is easy for young athletes to take criticism personally and perceive it as an attack (on self) from the parent, instead of interpreting it as helpful advice from you the coach. Do your best to draw a line between your roles as a coach and as parent. Define the line and time between the two roles. 10. Ask the right questions after games. Asking the right questions after games tells your child what you think is important in sports. If you always ask: “Did you win?” or “Did you score?” your child will think winning is the most important. If you ask: “Did you have fun?” he will assume having fun is important. 11. Fuel their confidence. 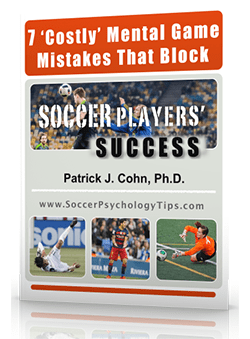 Confidence can be fragile for young soccer players. You want to help your athlete develop a healthy base of confidence that does not go up and down drastically depending only on the last game. Real confidence is stable and enduring. Help your child grow confidence by focusing them on what they did well after each game. Encourage them to improve upon instead of dwell on mistakes, and help them think positively when they have doubts. 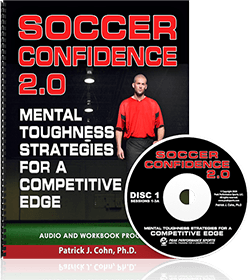 We’ve just released our soccer specific mental training program “Soccer Confidence: Mental Toughness Strategies for a Competitive Edge.” Learn more about how to help athletes perform with confidence, focus, composure, and intensity.